Hostess lovers and X-Men fans can find promo codes in specially marked packages of Hostess products. They can then enter the code for a chance to win one of dozens of daily prizes and be entered to win the grand prize – an action-packed trip for four to Montreal, where X-Men: Days of Future Past was filmed. The grand prize trip includes eXtreme fan adventures including rock climbing, speed boating and a high-flying trapeze experience. Daily prizes include X-MEN gear packages, exclusive art pieces, movie tickets, Blu-ray™ collections, posters, and coupons for Hostess snack cakes. Fans can visit local retailers and grocers to find multipacks of Hostess eXtreme Creme Blue Raspberry flavored Twinkies and Strawberry flavored Twinkies, original Twinkies and Chocolate CupCakes featuring promo codes and detailed information about the sweepstakes. 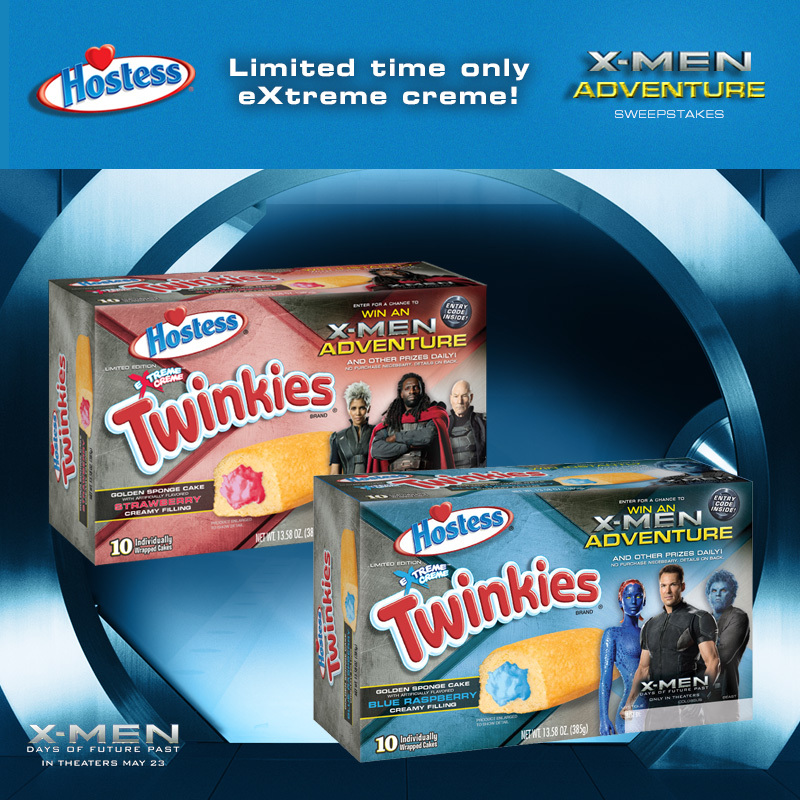 Twinpacks of Twinkies and Hostess Chocolate CupCakes as well as dunkie bags of Frosted, Powdered, Apple Cinnamon, and Frosted Devil’s Food Donettes® will also feature limited-time X-Men packaging. Visit www.facebook.com/hostess for official rules and how to enter.